Professional Triathlete Chris Lieto announced today the launch of Base Performance Nutrition. Base Performance Nutrition provides premiere nutritional supplements for endurance athletes. Base has developed a unique and simple system with a variety of products for endurance athletes to create a strong nutritional base. Athletes know the value and importance of base training. The theory behind Base Performance is no different. Having a strong base nutritionally will allow athletes to maintain a healthy body so that they can train, recover, adapt and get stronger in order to perform at their very best. "In addition to training and racing this year it has been important to me to have balance in my life and plan for my future. This year I created that balance with work and family. I have been busy launching my new company Base Performance Nutrition. I have had years of learning what works for me and what doesn't work for me and I want to share my successes with those who are passionate about endurance sports. Nutrition is a tough part of the puzzle and I want to help others succeed in this area." 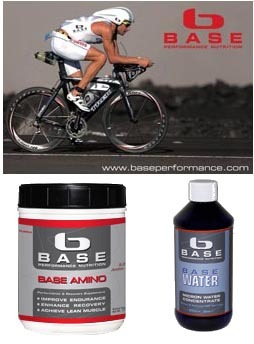 Base Performance Nutrition has launched with two products: Base Amino and Base Water. Base Amino is an amino acid powder product that athletes can mix in to their beverage of choice. Base Amino enhances recovery, improves performance and increases lean muscle. Base Water is a structured water concentrate that is added to filtered water for water that is 8 x's more hydrating than water alone. Base Performance Nutrition will release two new products over the coming months. Chris is a three-time Ironman Champion and former U.S. National Ironman Champion. Lieto recently placed 6t at the 2007 Ironman World Championships in Kona, Hawaii. To learn more about Chris please visit www.chrislieto.com. Base Performance Nutrition is a premiere line of nutritional supplements that sustains superior performance. To learn more please visit www.baseperformance.com.